Bill Clinton greets friends at the voting registration tent at Made in America Sunday. 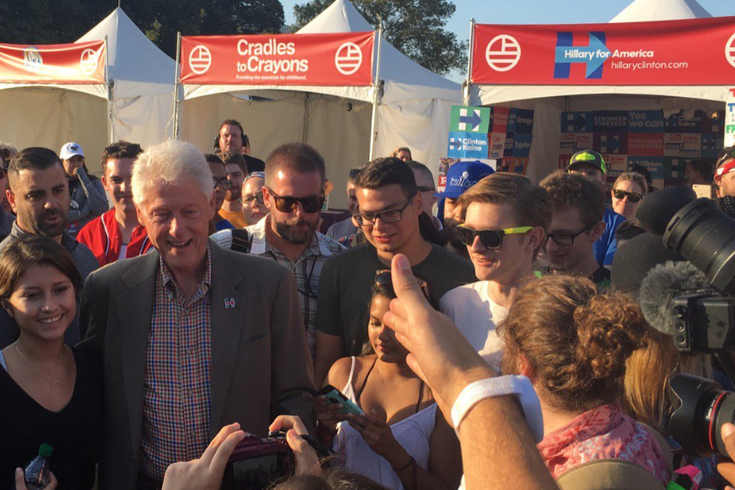 Why was Bill Clinton at the Budweiser Made in America Festival? A spokesperson with the Hillary Clinton campaign said the husband of the Democratic presidential hopeful was partially there promoting iwillvote.com – and, he was sure to stop by the festival's voter registration tent. Photos of Bill Clinton circulated on social media around 6:30 p.m. Sunday, smiling, taking selfies and even aggressively petting one woman's puppy. The informal meet-and-greet comes months before November's general election where Hillary Clinton will go head-to-head with Republican nominee Donald Trump. An August poll from Franklin & Marshall College shows that Hillary Clinton leads Trump, 47 percent to 40 percent, in Pennsylvania. For months, actors and celebrities from across the country have been announcing their support for Hillary Clinton. Bill Clinton has also been campaigning for her. And who's on Hillary's side? Beyoncé Knowles. The musician has contributed to her campaign while husband Jay Z – who curates Made in America – was once fitted on the bill to ring in Bill Clinton's 65th birthday party at the Staples Center in 2010. The Clintons were in Philadelphia just months ago during the 2016 Democratic National Convention where Hillary Clinton officially became the first woman nominated by a major party. On the day of the official nomination, Bill Clinton came on stage and gave a speech that went back to when the couple first met at Yale Law School. "...I met and fell in love with that girl in the spring of 1971. When I was president, I worked hard to give you more peace and shared prosperity, to give you an America where nobody is invisible or counted out," he said during the speech. "But for this time, Hillary is uniquely qualified to seize the opportunities and reduce the risks we face. And she is still the best darn change-maker I have ever known." Tonight, Clinton isn't scheduled for any formal appearance at MIA, but it is the last night of a two-day festival that draws hundreds of thousands to the Ben Franklin Parkway every Labor Day Weekend since 2012. Rihanna wrapped up the first night of MIA Saturday while Sunday's headliner, Coldplay, will take the Rocky Stage at 9:30 p.m. after Chance the Rapper's performance at 7:30 p.m.
Medics also responded to about 1,000 who rushed the festival's Liberty Stage Saturday after hip-hop artist Jay Electronica called out to his fans to join him. Live Nation's contract with Philadelphia is set to expire next year, and MIA's future isn't exactly clear. Roc Nation, Jay Z's company, is a co-producer for the festival.